I realise that I'm in the minority on Wes Anderson's previous film, Fantastic Mr. Fox, whose script I despised for its self-indulgent disregard of Roald Dahl's sense of humour in favour of the auteur's own hipster-ish vision. I'm retroactively even more angry at what appears to be a total misunderstanding of the young audience, after watching Anderson's latest, Moonrise Kingdom, which shows a consummate understanding with children. It's one of only a few movies I can think of that centres around boy scouts, and Anderson's central conceit is to show the young scouts acting surprisingly maturely, for their age, while the adults in the movie are flustered into a frenzy by their behaviour. Our hero is 12-year-old Sam, (Jared Gilman) an unpopular Eagle Scout who affects a corncob pipe and a coonskin cap. 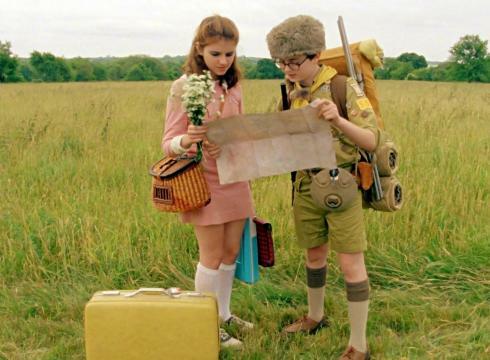 Moonrise Kingdom is now showing in cinemas nationwide.